Hundreds of plastic fragments taken from the Eastern Garbage Patch fill a Petri dish that is also crammed with insect-like water striders and blue copepods. Be sure to check out Lindsey’s photos of the patch on the slideshow below. Reporter Lindsey Hoshaw recently returned from a trip to the Pacific Garbage Patch. She was the only journalist on a scientific expedition led by Charles Moore, who discovered the patch 12 years ago. QUEST reporter Amy Standen talked to Lindsey about her trip to the patch and what she found there. Tell me a little bit about your trip to the Pacific Gyre. How long did it take, and what was life like onboard? It took about a week to reach the patch after we set sail from Honolulu, Hawaii. There were four other crew members besides myself: first mate Jeffery Ernst, Algalita director of research Gwen Lattin, University of North Carolina at Wilmington graduate student Bonnie Monteleone, scientist and director of UC Irvine’s Urban Water Resource Center Bill Cooper, and, of course, Captain Charles Moore, who discovered the patch. The living conditions were tight. We each had our own bunk and there was one common living area where we’d eat meals, work on our laptops, read, and generally unwind at the end of the day. The meals that Captain Moore cooked were definitely the highlight. We ate fresh Mahi Mahi and had fresh fruit and vegetables throughout most of the trip until we started running low at the end. Can you describe what the plastic patch looks like, as you approach it in the boat? Is it something you can see from a distance? The patch is very difficult to describe because it’s not all stuck together. Imagine if you dumped a small wastebasket full of trash in an Olympic-size swimming pool. It wouldn’t all stay in one place and it might not all float. Most of the patch is made up of tiny plastic particles that are the size of grains of rice. It’s not something that you’d “see as you approach.” In a way, there’s no single feature to approach; the boundary of the garbage patch is hard to define because there is plastic throughout the Pacific. When you’re out on the bow sometimes you won’t see anything and other days you’ll see a rapid-fire succession of empty barrels, rope, buoys, plastic water bottles, and lots of unidentifiable plastic fragments. I’ve often been asked why you can’t see the patch from Google Earth and this is precisely why: The pieces are so tiny, water isn’t a fixed feature, and many of the fragments float beneath the surface. Describe the moment you reached the gyre. What were your first impressions? Actually reaching the gyre was a little anti-climactic because we collected trash throughout the journey — not just when were in the highest accumulation zone. It’s not like driving from one state to another where you’d see the road signs and vegetation change. My impression overall was surprisingly tempered. It was strange to see toothbrushes and water bottles and a toilet seat floating in the middle of the ocean. But if you think about how much plastic we produce each year, it completely makes sense. If the average American produces over four pounds of trash a day, how can we be surprised that it’s ending up in the ocean? Is there any single type of plastic that seems most prominent? (E.g. plastic bags, or fishing nets?) How much of the plastic is still recognizable as a specific product? The four most common items we saw were ropes, buoys, water bottles, and 55-gallon plastic barrels. Things like umbrella handles, toilet seats, toothbrushes, and light bulbs were much less common. There seem to be more identifiable objects if you’re measuring by weight but if you’re counting the number of plastic pieces then there are many more fragments than specific products. Scientists believe most of the plastic in the gyre is from the Pacific Rim, off the coasts of North America and Asia. Some is obviously from commercial fishing vessels; the rope, nets and buoys likely drifted away from fishing operations or may have been intentionally dumped. The question about plastic’s journey from a consumer to the patch is an interesting one. I would love to see a model of how this occurs or a report that charts the path of one piece of plastic from producer to consumer to the patch. Thus far I haven’t seen this and we can’t pick up a piece of plastic from the patch and say, “here’s how this got here.” That said, here’s a likely scenario: Someone on-the-go buys a water bottle and tosses it in the trash. The trashcan happens to be full and the water bottle falls onto the sidewalk. That night it rains and the water bottle goes into a storm drain that empties into the bay. From there it is slowly sucked out to sea and ends up in the North Pacific Gyre, which keeps everything swirling together in a giant whirlpool. Are there any known human health effects from eating large ocean fish with high concentrations of plastic-derived toxins? And what kinds of toxins are we talking about? Obviously there’s a precedent for this: We’ve been warned about the inherent dangers in eating tuna that contains mercury. If we are eating large ocean fish with high concentrations of plastic-derived toxins, they may be leaking into our tissues but most table fish (the fish we eat) don’t come from the garbage patch. More research needs to be done on this subject. The types of toxins we’re talking about are DDT and PCBs, among other things. Having seen the patch in person, does it seem feasible that the Pacific gyre (or any of the others) could ever be cleaned up? Any idea what the leading strategies might be? I am an eternal optimist, so while it would be extremely difficult to clean up, I still believe some sort of removal program may be possible. What may happen in 100 to 200 years is that we start to see this plastic as valuable once petroleum is no longer available. If rescuing the plastic becomes profitable then I could see people investing in large commercial vessels to try and clean it up. But right now I haven’t seem any clean-up endeavors that have convinced me they can remove an ocean’s worth of trash. … Or, does the focus seem to be more on understanding the patches so that we don’t keep adding to them? Of the four groups I know of who are studying the patch — the Algalita Marine Research Foundation, Scripps Institute of Oceanography, Project Kaisei and the GP2 Project — the first two are devoted to research and the latter are l ways to clean up the mess. There’s so much that needs to be understood in this arena, I think research is the way to go at this point. For everyday citizens, our best bet is to do away with single-use disposable items like water bottles and take-out containers and plastic bags and coffee cups. I’ve started carrying around a mason jar, à la No Impact Man (http://noimpactman.typepad.com/), for coffee and restaurant leftovers. It’s just a matter of convincing ourselves that one hour of enjoyment with a disposable coffee cup is not worth a lifetime of plastic pollution. Tune in April 20, 2010 for a new QUEST TV story, Sea of Plastic. 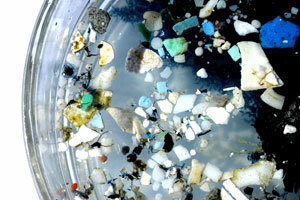 You can also listen now QUEST Radio’s story on the Pacific Garbage Patch online. Funds for Lindsey’s trip to the garbage patch were paid in part by Spot.us.